President John Fitzgerald Kennedy was assassinated on Friday November 22, 1963 and buried in Arlington National Cemetery on Monday November 25. The Temple planned a memorial service for him in the Temple Sanctuary. It would be held on the morning of Sunday, December 1. On Thursday November 28 - Thanksgiving Day - Abba Hillel Silver was at his home in Shaker Heights. He may have been working on his eulogy for the president. Early that afternoon, while sitting down to dinner with his family, he became ill. His sons Daniel and Raphael rushed him to the hospital where Abba Hillel Silver died before 4 pm. 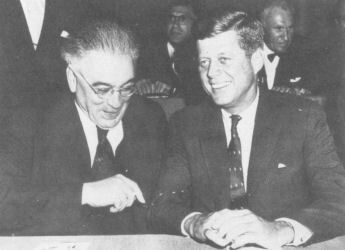 The photo at the left showing Silver and Kennedy at a meeting, was taken in 1963. 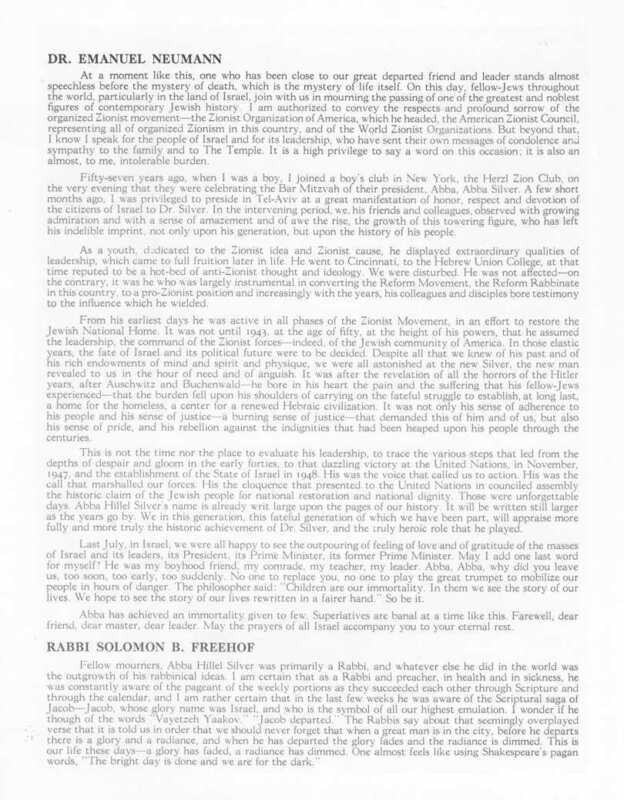 Thus, when the members of the congregation met at The Temple on Sunday morning, December 1, 1963, it was not to honor their fallen president, but to say farewell to the man who had been their rabbi for 46 years. They were joined by a former governor, a senator, a representative of the State of Israel, the leading tenor of the Metropolitan Opera and so many others who filled the sanctuary, the auditorium and even stood on the street outside. 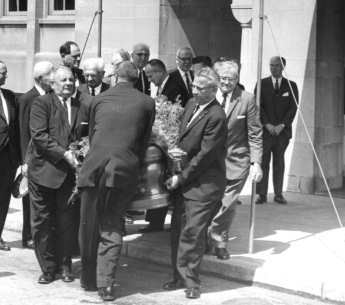 The photo at the right (source: Cleveland Temple Memorial)	shows pallbearers carrying the bronze sealed casket out of the Ansel Road door of The Temple. His body would be interred at Mayfield Cemetery in Cleveland Heights. 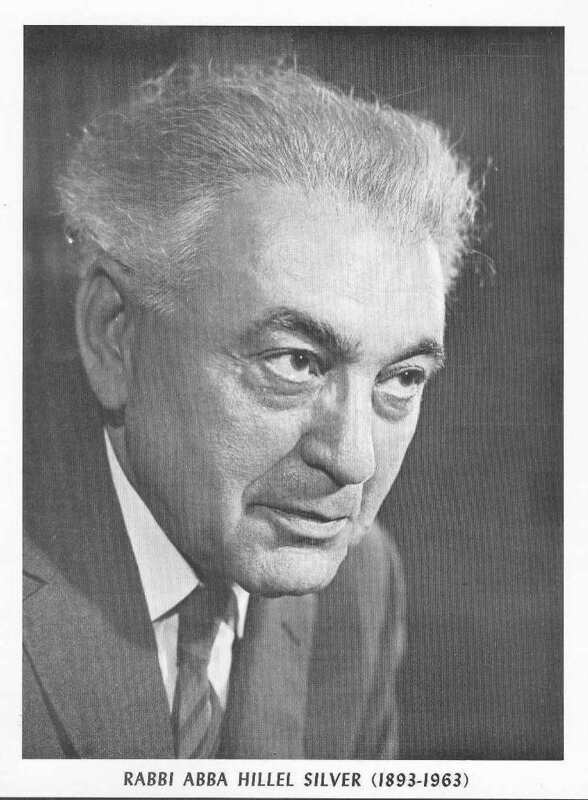 It has been reported that the eulogy Abba Hillel Silver wrote for President John Kennedy was read at the funeral service. Not so, based both on my memory and the printed program, a copy of which is shown below. For my recollection of the service, click here. Leading tenor of the Metropolitan Opera. American-born (as Rubin Ticker) son of Bessarabian immigrants. Before making a career in opera he had been chazan (cantor) at the Brooklyn Jewish Center. more .... More on El Moley Rachamin. 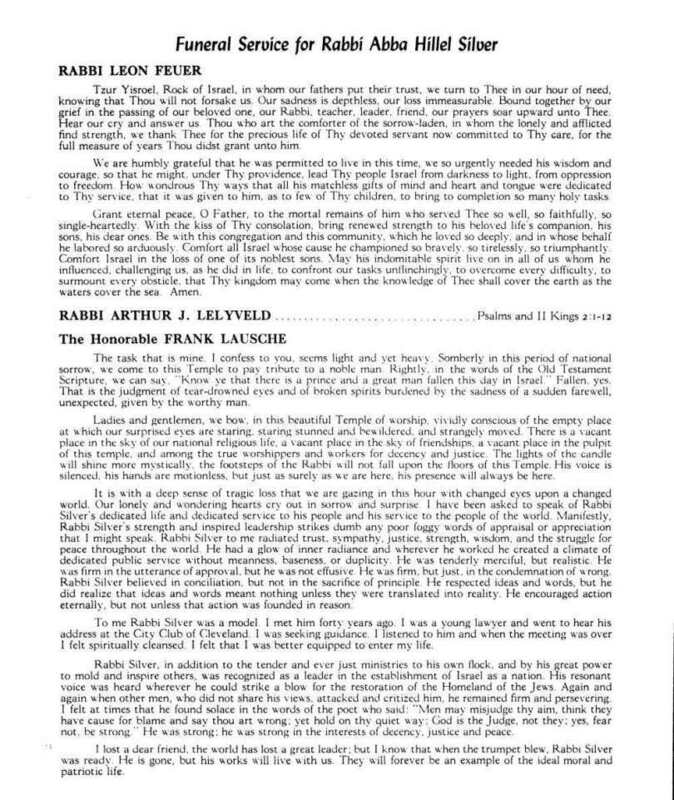 A few weeks after the funeral The Temple sent a funeral program to its membership. 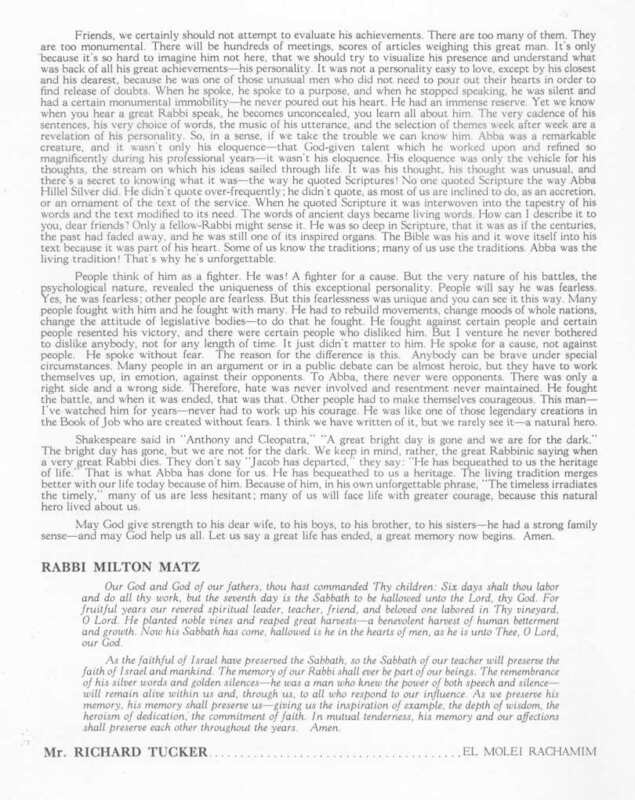 We show its four pages below. Thanks to The Temple - Tifereth Israel and Susan Koletsky for these materials.